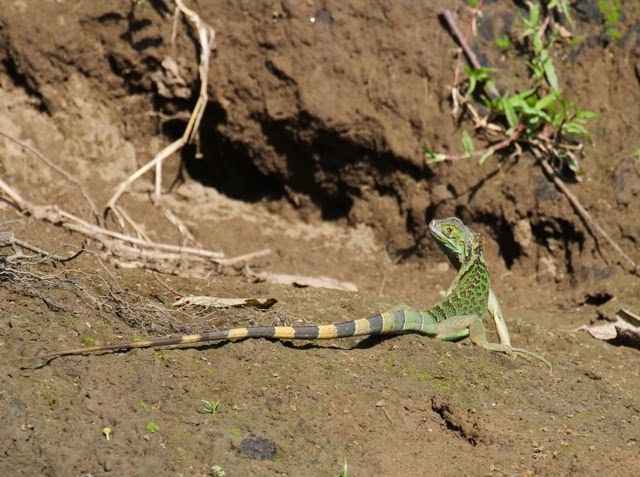 Costa Rica Birding with Zick! 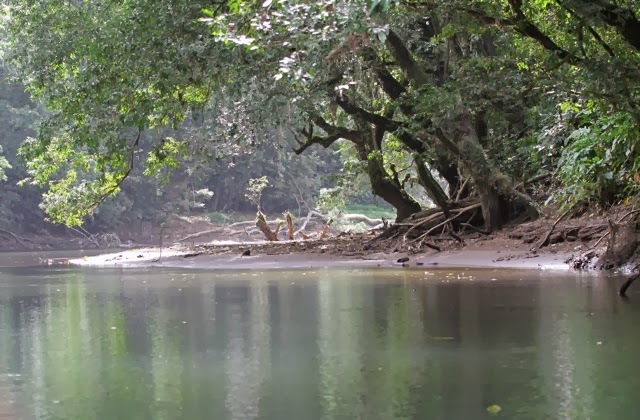 A morning trip on the Rio Sarapiqui into La Selva Biological Reserve was just the tonic we needed. 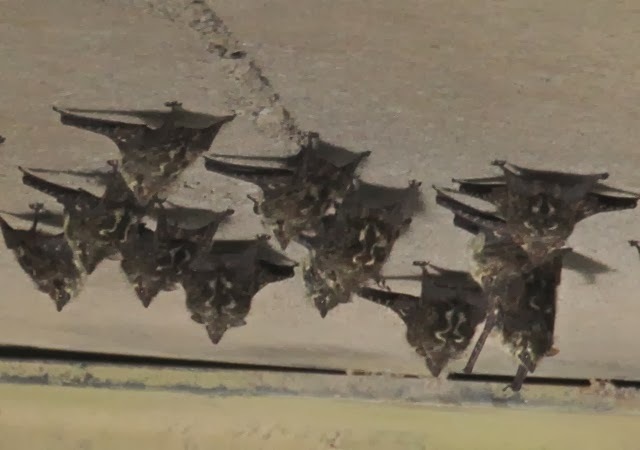 And it was off to a good start, with a colony of long-nosed bats clinging to the underside of the dock! Right off the bat, I'm happy. These little characters roost in fairly conspicuous places, often in charming vee patterns. 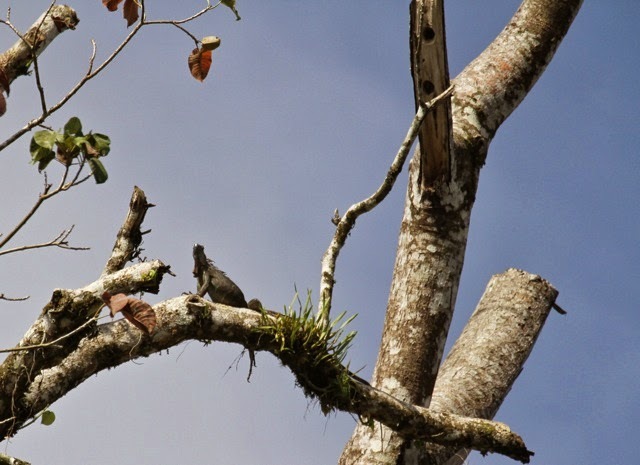 I've seen them in Guyana, clinging in staggered lines to vertical palm trunks near the water. Right out in the open, but looking like marks on the bark. 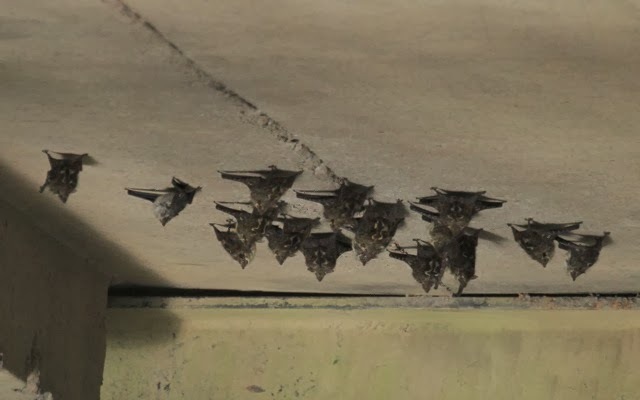 The outflung wings are characteristic--quite a different roosting position than most bats. I marvel that they can cling perfectly upside down on concrete. It makes me wonder if there is some suction capability in their feet, in addition to sharp claws. Everything about bats amazes me. A closer look reveals mouselike faces and a fabulous fiddle-shaped pattern on their backs. I don't know why some bats are so ornate, but I'm thankful for it. Sorry for the lousy photo--it was the best I could do in the dark and distance. 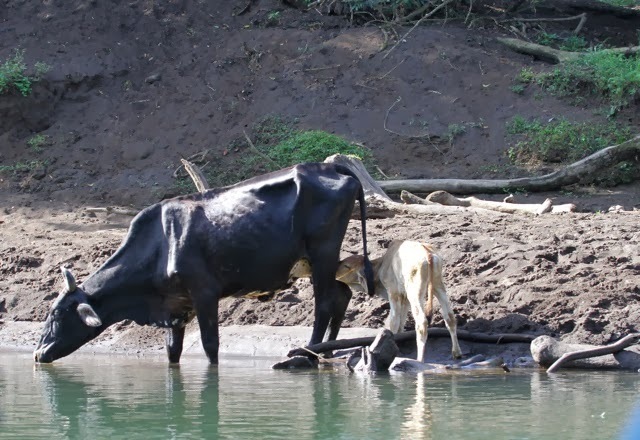 Sunlight flooded the river, and there was an endless parade of life forms to admire. Drinking from Mom, while she's drinking. This reminded me of the days nursing my kids when I'd fill up a quart jug of water and have it drunk down by the time they were done. I felt like some kind of vending machine, turning all that water and food into milk. That's a pretty incredible thing to ask one's body to do, and it fascinated me, getting in touch with my mammalian heritage. or scurrying along the bank. This is a lovely youngun'. They get a bit less gaily marked as they age. 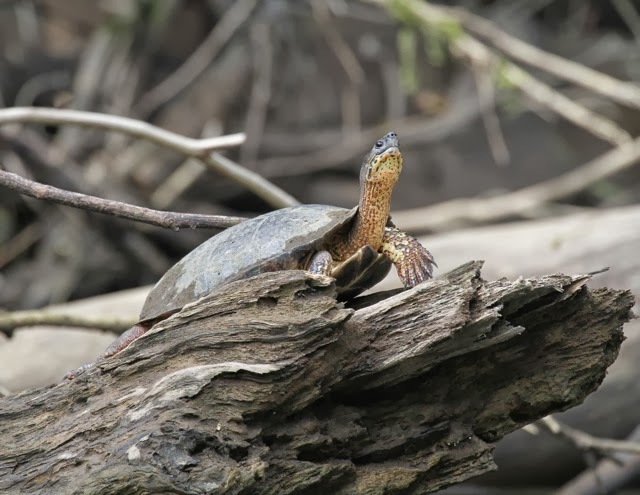 A noble-looking black river turtle watched us slide by. 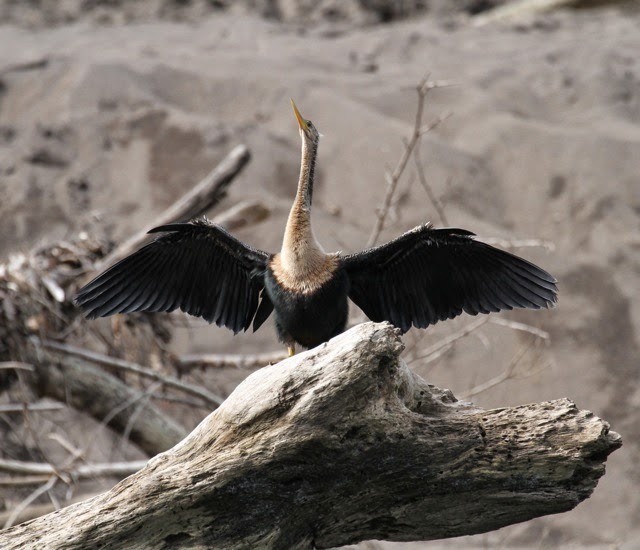 This female anhinga turned jerkily as we passed, giving us every possible angle for our cameras and making us all giggle. Here. How about this side? Like this angle? 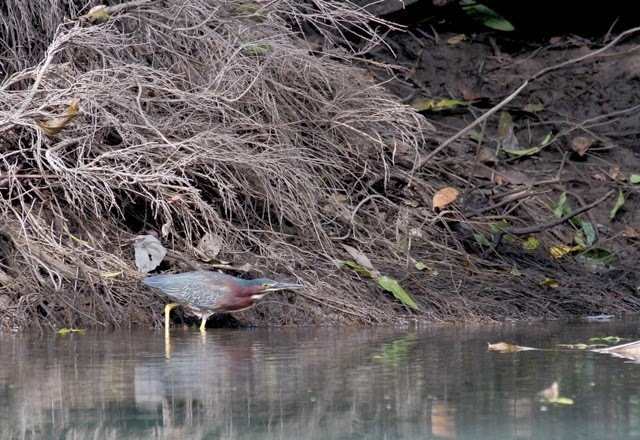 A green heron stalked the shallows. Whether I see it in a West Virginia backwater or a Costa Rican river, it always delights me with its subtle combination of rust, maroon and oiled verdigris. The same goes for the wintering spotted sandpipers, constant companions on the Muskingum and the Sarapiqui alike. Who knows. 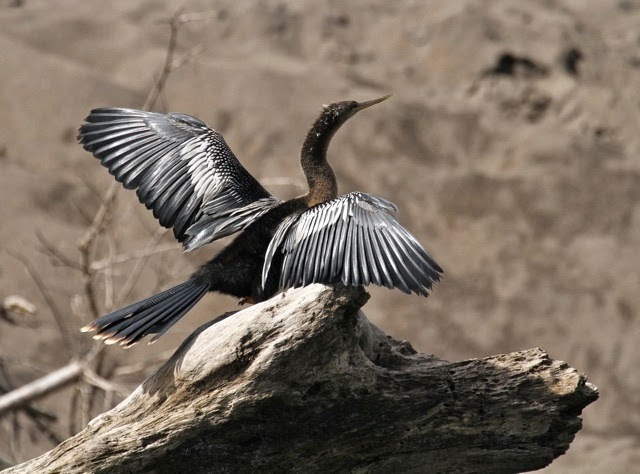 This bird may come back to nest in Ohio. 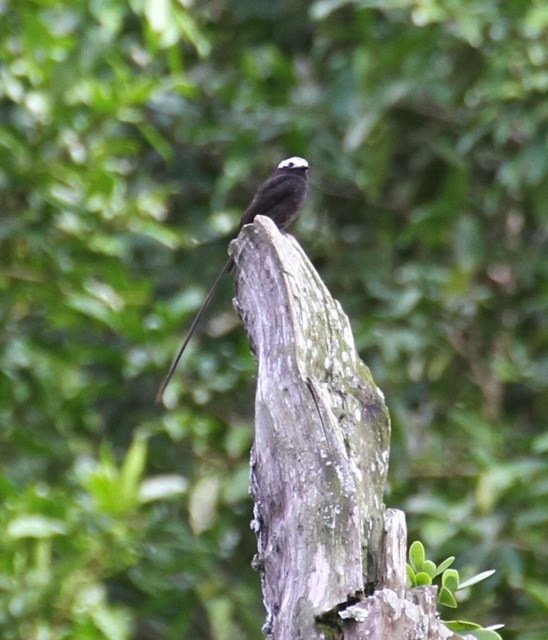 But this one won't--a long-tailed tyrant! Now those, we don't have. 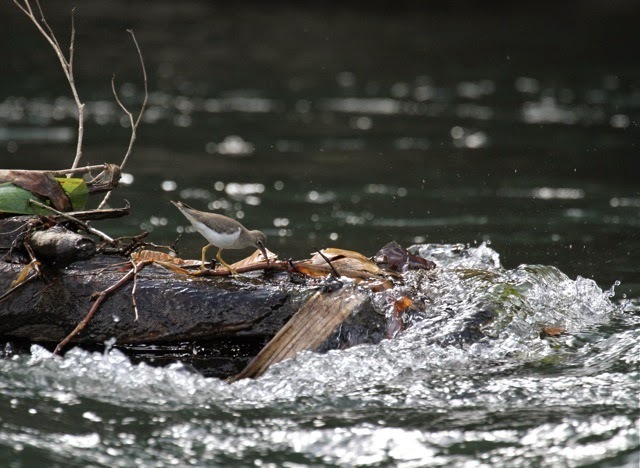 That's a mighty fancy flycatcher, perching out in the open on a river snag, waiting for a hapless insect to fly by. 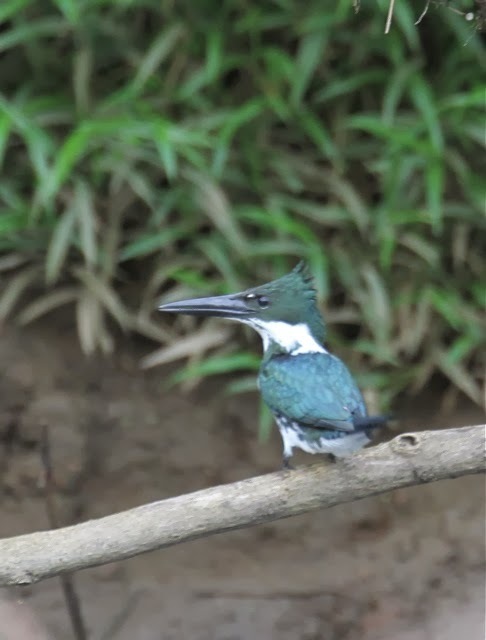 And here's the bird that caused such a stir at last November's Rio Grande Valley Birding Festival--the Amazon kingfisher. My friend Jeff Bouton, a rep for Leica, found it, and all hell broke loose in the birding community. This one seems unaware that, if it only flew a couple thousand miles north, it could be a star. Egad, what a face. Give it some skin-stretched wings, and you've got a bitchin' pterodactyl. Back where the Quetzals fly. Love this! I've taken a boat tour on that river before, and enjoyed the Tiger Herons. I kept wondering what kinds of tiger beetles might be scurrying around on the large sandy patches of riverbank, but never had the chance to look. Wonderful words and photos! Every time I see a kingfisher, any kind of kingfisher, it is my favorite bird. Until something else flies by. I'm basically Cretaceous with attention deficit disorder. Thanks for the vicarious thrills.